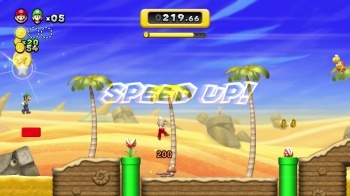 With 243,000 units sold, New Super Mario Bros. U has a 60% attach rate to Nintendo's latest console. November was a big month for Nintendo; the publisher launched its new console, the Wii U, while Black Friday deals helped boost sales of the Wii, 3DS, and DS systems. As a result, Nintendo sold 1.75 million hardware units in the United States last month, a decent chunk of which can be attributed to the Wii U. The new console moved 425,000 units in its first seven days, which is slightly higher than the original estimate of 400,000. Not about to be left behind, 420,000 Wiis were sold during the entire month of November. While Nintendo's consoles certainly weren't slacking in the sales department, handhelds actually made up more than half of its November hardware sales. The 3DS had impressive sales of 540,000 units, bringing its lifetime total to nearly 6.5 million. The DS, in its amazing 97th month on the market, still moved 370,000 units, and according to Nintendo "will cross 53 million units sold life to date in the next few days." Nintendo didn't release much software sales data in its press release, but it did mention New Super Mario Bros. U, which sold 243,000 units in its first week--an attach rate of 60% for customers also purchasing Wii U systems. Meanwhile, Mario Kart 7 became the second Nintendo 3DS title to sell two million copies in the United States. The Wii U's unit sales don't quite match up to the Wii's seven-day sales after its 2006 launch; Nintendo sold 475,000 during that period. Nintendo of America Executive Vice President Scott Moffitt was happy with the results, however, reiterating that the Wii U "is essentially sold out at retail." Whether the console retains its "status as the 'must-have' product," as Moffitt describes it, throughout the holiday season and beyond remains to be seen.